Everyone knows about the Cosby Sweater. The oversized sweater with crazy designs was all the rage in the 80's, made popular by Bill Cosby on The Cosby Show. (Sorry for all the Cosby Cosby Cosby talk.) And, while I like to believe I was always super fashionable, I think I had a few moments of ... well ... just the opposite. (Just wait until you see my Throwback Thursday post about jumpsuits.) I happened to own my very own version of the Cosby Sweater with the very one you see above. 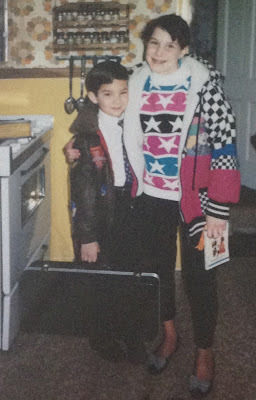 Rocking my Cosby Sweater with an equally bold patterned jacket, bow-detailed flats and the best accessory of all: my brother, Evan! Plus, you know what? 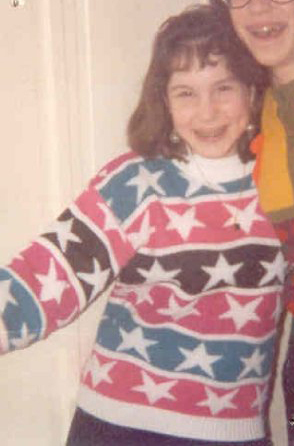 I actually would wear that sweater today if I still had it. Old habits die hard.